When my son was about three weeks old I had a friend recommend reading Babywise. I loved the entire book and started putting the method into practice right away. With one exception: the pacifier. 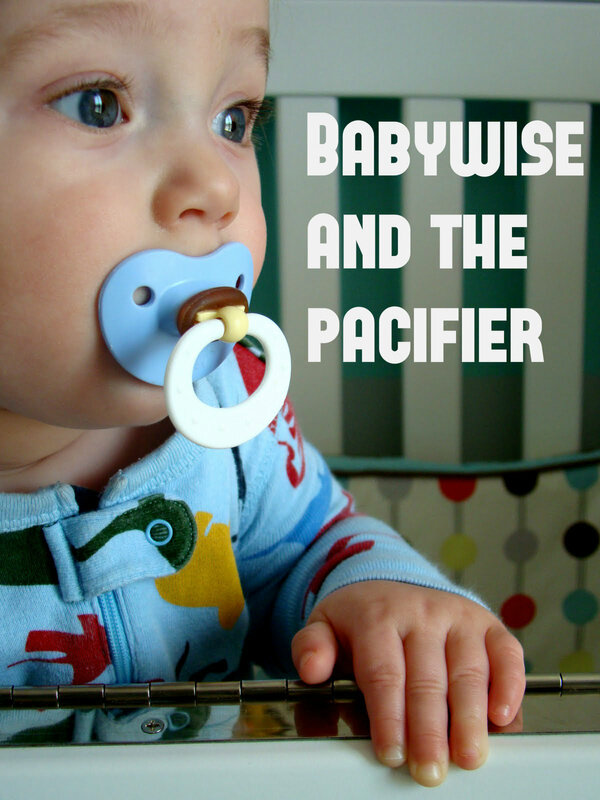 By the time I had read the book my son was already a “paci baby.” Babywise encourages use of a pacifier at times when a baby is fussy but not hungry. However, it warns of allowing the pacifier to become a sleep prop. And, for us, a sleep prop is exactly what the pacifier had become! My son “needed” the pacifier to sleep. He was swaddled and, therefore, I spent a TON of time in and out of his room re-inserting the pacifier every time it fell out. Over and over again I’d be in his room popping it back in. I had such a distain for the pacifier and swore I’d never use one again! As I got more invested in the Babywise lifestyle I worried whether or not my son’s pacifier use was allowing him to be a true “Babywise baby.” He never really cried it out because I’d go into his room to give him back the paci. Was I preventing him from getting the best sleep possible? I know many Babywise moms who use a pacifier will recommend giving it the baby at the start of nap or bedtime but then once it falls out just letting the baby cry it out. I did not feel comfortable with that idea as it was MY fault he had a need for the pacifier. I was the one who had introduced him to the sleep prop. While he never truly cried it out, I would ONLY go in his room when the paci fell out, put it back in, and leave again. I didn’t get him out of the crib. I didn’t sing to him. I didn’t help him go back to sleep in any way other than giving him back his paci. I had a fellow Babywise mom who also used the pacifier and made me feel so much better about my situation. She said as long as I was letting him self-soothe (even with the sleep prop pacifier) that it was okay to have to go in his room throughout naps and some in the night. He was still self-soothing to an extent since he wasn’t using ME to soothe him. The day finally came when my son was no longer in the swaddle and was able to pick up a paci when it fell out of his mouth. Oh my goodness, it was a HAPPY day for me for sure! We put several pacifiers in his crib with him so if one fell out he could easily find another and his sleep patterns improved drastically! We always had the rule that the pacifier was only allowed during sleep times and we did not wean him from the pacifier until his second birthday. It was not too difficult of a process to get rid of it (I slowly cut the tip of the paci down each day until he no longer had any interest in sucking on it) and he remained a good sleeper without his “prop” once it was gone. We did learn our lesson and our daughter is NOT a pacifier baby. We did cry it out with her at about twelve weeks old and she did not have to do much crying at all until she learned to completely soothe herself. She sleeps solid for all of her naps and at night. She LOVES her crib and is so happy to go to bed and also always wakes up happy too! I LOVE the pacifier-free life and I feel it has allowed us so much more freedom. We aren’t having to go into her room over and over to insert the pacifier. She also isn’t waking up over and over due to the pacifier falling out of her mouth. 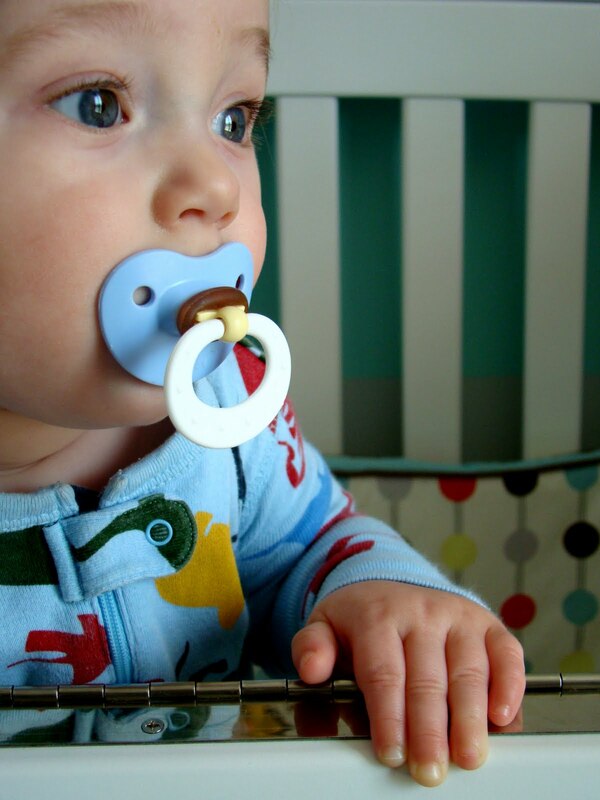 I am SO HAPPY that Cooper isn't a paci baby! It is SO MUCH BETTER!